Saskatchewan has a knack for churning out bands with impeccable pop ears. One of those that's been on the forefront of that is Rah Rah. 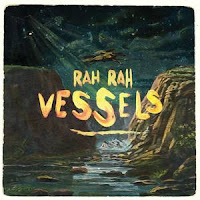 Last week they released their latest studio album, Vessels. What Rah Rah does so well is write melodic, catchy pop masterpieces. In fact, a better band name could be An Abundance Of Hooks. They don't waste any time getting right down to them either, as the opener, "Be Your Man", is an absolute gem. Tracks like "A Love That Sticks" and the glossy "Diamond" boast hooks galore. None may have more than the standout "Good Winter". The band do stray into less traditional (for them anyway) territory. "Wolf Eyes" is a darker tune, but one that doesn't relinquish any of it's melody. The frantic indie rock of "Surgery" is laid on top of a bed of a Spaghetti Western score. The album closer "In Space" has a disembodied vibe that can be characterized as sci-fi indie pop. The best example though, is on the stellar "Chip Off the Heart", the Erin Passmore-sung modern dance tune sounds akin to something we'd get from CSS rather than Rah Rah. And it is marvelous. Vessels is an album that you can throw on for any occasion. It's destined to land near the top of the list of my favorite albums of 2015. Best tracks: "Chip Off the Heart", "Good Winter"
Chip of the heart is actually sung by Kristina Hedlund. Good review though!